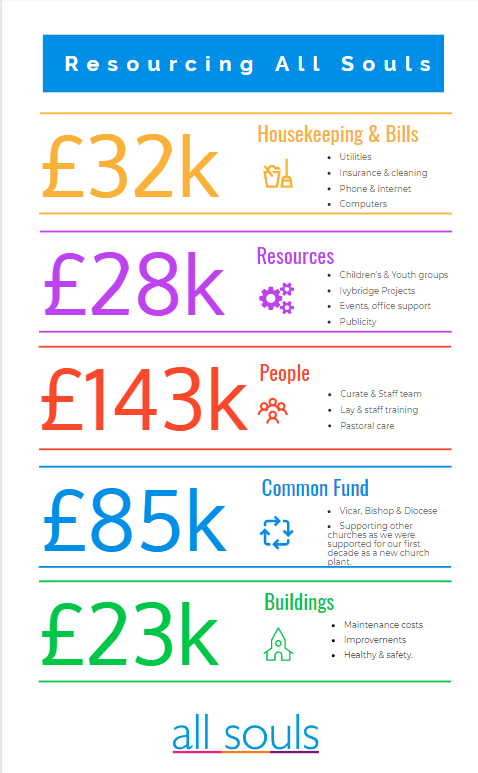 Church life costs – from the craft children learn through and the refreshments we enjoy, to the staff team we value and the buildings we use. We give because we don’t want the cost to be met by just a few. 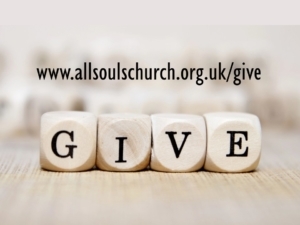 We give because it’s good for us and because it makes a significant difference to All Souls, transforming lives and local communities. And most of all we give because it’s one important way of responding to God’s generosity towards us. The health of All Souls depends on givers regularly considering whether they could give more, both to pick up some of the responsibility from those who move away or whose personal circumstances change and also to make possible new life and ministry. If you’re giving already, would you consider an increase this year? 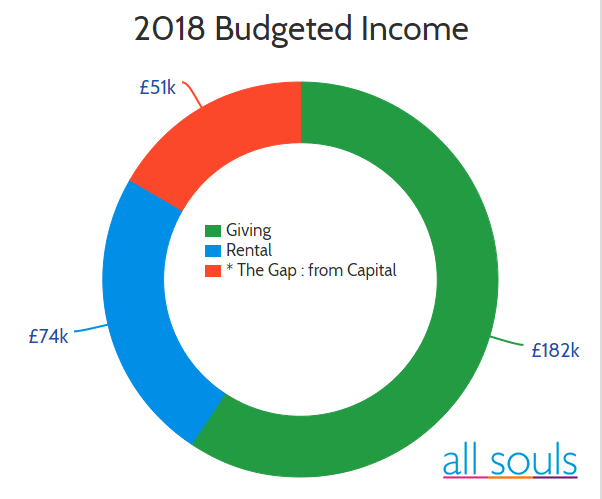 More than 70% of our income needs to come from the generous regular giving of members of All Souls. 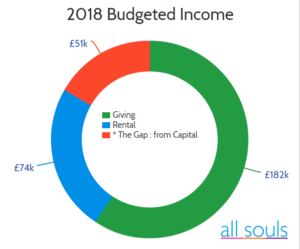 In 2018, we predict that more than £50k of our expenditure won’t be met by either rental or giving income. That gap will be covered from capital this year, but at that rate, in 2021, the capital will be spent. We need to increase our giving to cover the gap. Some give a few pounds a month and others can commit to hundreds. Some Christians aim to give 10% of their income away as many have done through the generations. Whatever the amount, we aim to give out of gratitude to God rather than duty and to be wise as well as generous. Who looks after the money? Finance Manager – (Post currently vacant) They handle weekly income (including Gift Aid) and expenditure and our Sage accounting package. PCC Finance Team – chaired by Richard Frank and including the Treasurer Tim Stephens meet regularly to consider overall strategy and big spending decisions. The PCC – acts as the charity trustees for All Souls and receive reports from Finance Team and Finance Manager. The Staff Team follow the church Financial Management Policy. Our accounts are presented at the Annual Meeting and can be requested at any time afterwards. Expenditure is monitored by our Finance Manager, Treasurer, Finance Team and PCC on a weekly, monthly, bi-monthly and annual basis. Housekeeping & Bills – (£32k) the basics of church life – i.e. the regular bills! Resources – (£28k) for children, teen & adult groups, office equipment, a.v., printing and outreach events. We also give ~£200pw to support worldwide Christian work. People – (£143k) housing for our curate, the salaries of a small office team, our Children’s Team Leader and expenses of our clergy, as well as a fund to assist those in specific need. 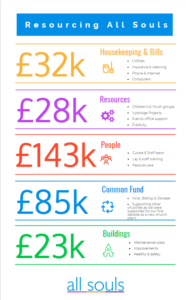 Common Fund – (£85k) after ten years of being subsidised by other churches, we are finally “paying our way” by covering the salary of having a Vicar, the central costs of the Diocese and now starting to provide for other churches that are struggling. Buildings – (£23k) a 130-year-old church, and heavily used halls need to be maintained and equipped to be effective bases for mission. Make sure you have completed a Gift Aid form online here (or from the church office) – it adds 25% to your donation at no extra cost to yourself! You can also give using an envelope from inside the main entrance of church.